Greatly Improved JFET Matcher is here! So you wanna build a Phase 45 or Phase 90 or one of its derivatives? Ahh, you need *matched* JFETs, so just read on... This was motivated by my latest experiments with a Phase 45 clone. On the other hand, if we make Vgs = Vp, we get a division by zero, meaning infinite resistance (JFET fully OFF). 1) Any pair of JFETs that have close Vp *and* Idss are *matched*. Coincidence on just one parameter is not enough! Example: For the same MPF102, let's calculate the required Vgs for a 10k Rds. As you see, the circuit is fairly simple. Only keep in mind the OpAmp MUST be MOSFET input to avoid altering the weak current through the 10Mohm resistor for the Vp reading, and must be capable of going down to GND (or the negative supply rail) for proper Idss reading. After you characterize both Vp and Idss for each JFET you have, just find those with closest Vp AND Idss. Good work. I had not been through the math to realize that only two parameters needed measured; that's not true for bipolars, you need to match several. My harangue on matching JFETs previously in the archives points out why I left it at only one parameter - it's simple, and it works well enough. If two points are all that are needed, great, this will be a real step forward. It think it needs a second battery. If you do that, you can use garden variety TL072's for the opamp, not a rail to rail CMOS opamp. Yes, I know that rail to rail is easy; but beginners can't often get anything except the most common things. I'd still be happier with a way to unload the Vp measurement. 10M isn't much of a load but it is some. The input of a FET opamp is much less. Good work!! It'll be interesting whether closer matching (and of which parameter) makes for more "musical" phasing. I have no factual basis for suggesting this, but I wonder whether "close, but not too close" will make the notches a pleasant depth. I have no factual basis for suggesting this, but I wonder whether "close, but not too close" will make the notches a pleasant depth. Unlikely. Notch depth depends primarily on how well the magnitudes of the dry and phase delayed signals match (i.e. null out) when they are mixed at the end of the phase delays. Typically, 20db of notch depth is enough, more doesn't hurt. Matching JFETs has to do with where the notches move in step with the LFO sweep. Ideally, they should all move in synchrony. If not, the notches move in odd ways, and it's the movement that we hear as phasing. If they're not well matched - and well matched to the LFO - then the sweep is not pleasant. Some JFETs won't sweep at the same times as others, and some will be completely off or on when the others are sweeping. R.G., yes, a second battery would alleviate the special characteristics for the OpAmp. I think there could still be some chance to adapt it for a TL071 at the expense of adding additional components. You always need some loading on the Vp measurement. The datasheets usually specify Vp at a given drain current. In the case of the J201 datasheet I have, it says at 10 nA (really low!). So, for a 2V cutoff voltage and a 10nA current you would need a 200 Meg resistor. Not very practical, especially considering the input bias current of the opamp will be in the neighbourhood and interfere with the measurement. Nevertheless, as the cutoff voltage is approached, the Vgs varies very little, and in practice the important fact here is that every JFET will be measured under the same conditions. Let's assume an MPF102 with -2V Vp. With a 9V battery, the current through the 10Mohm resistor will be 2V/10Meg = 200nA. Then Vds=7V, which gives a JFET Rds of 7V/200nA = 35 Mohm, so the JFET is pretty shut down anyway!!! The measurement will be pretty accurate anyway. yes, a second battery would alleviate the special characteristics for the OpAmp. I think there could still be some chance to adapt it for a TL071 at the expense of adding additional components. I don't think that would be worth it. TL072's are more common than 071's and usually cost the same or insignificantly more. I'd just use the dual. In fact, the price is so close, I'd always use a dual instead of a single unless i was matching a pinout. You always need some loading on the Vp measurement. In order to easily measure the pinchoff voltage of an FET, the current in the FET must be nearly pinced off. The low current level is sensitive to voltmeter loading, but can be bufffered with an operational amplfiier which also biases the FET. With the FET source voltage driven to zero at the amplifier input, the output voltage is Vgd. This voltage approximates Vp for a specified, small source current supplied through the resistor R.
The trick is to get that current down. Hey... use a reverse biased signal diode, the Millenium Bypass trick. Plop in a reverse biased 1N914 or 1N4148 and you get 10-25 nA of current flow. Bingo, you can measure almost to the datasheet spec. Yeah, yeah it won't matter to matching. OK, use the 10M. P.D. A simple way to avoid the additional 9V battery would be to use one of these voltage inverters. A cheap one would work well here, since there are no problems with the oscillator getting into some audio path. Yes, I was saving that one for the version with the switching automated by the CMOS switch and indictors on whether it's showing Vp or Idss. You know, the very next thing we need to get done is have someone run 50 or a hundred JFETs through this thing and see what the yield turns out. I did some thinking about matching, based on another post in the page. I think Vgs matching is more important than Rds matching if you have to choose for reasons of low yield. Different Rds values at any given Vgs value are not tragic, it just means that a given notch is not where it is expected to be in the frequency spectrum. Mismatched caps do the same thing, and we not only don't match caps, we "univibe" phasers by distributing the values in steps of about 10x. So if the yield is low for two-parameter matches, the thing to do is to grab the best Vgs matches and give a nod to Rds matching. Course, we won't know til we see some distributions. 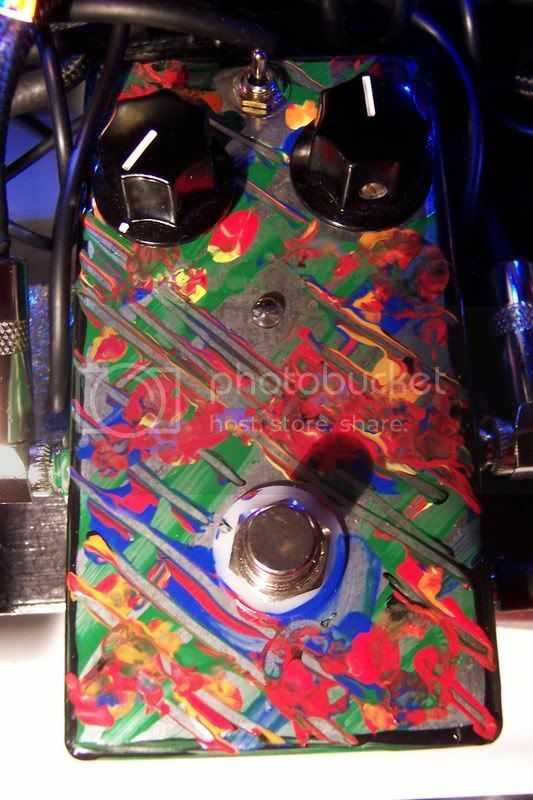 I don't think MXR was so deep looking in the matching stage of construction, maybe that was the reason why some P90 sounds different to others. BUT... if we can, why not to do a hard search for us? I have both PCB's P90 and P45 waiting to populate, and now i have more things to think. Fuzz boxes don't need on/off switch!!!!!!!! Wwell I have 4 + 6  Jfet phaser stages and lots of dual OA's. however all of a sudden im just getting these thoughts about the ultimate rack mounted analogue phaser with switchable phase stages and a whole host of other things. LET US INSTIGATE THE REVOLT,DOWN WITH THE SYSTEM! Well, after posting this circuit yesterday in the afternoon, I continued at night with the experimentation on the Phase 45. I had 15 MPF102's, which I had previously matched for resistance (Rds) at two points: 1 kohm and 20 kohms. I found several units that matched at one of these values but not at the other, but finally got two pairs that were reasonably close. The problem is I had to use an analog voltmeter, so I didn't have much precision on the readings. Today I'm gonna buy a DVM and try the matching with the proposed technique. Anyway, I finally redesigned the Phase 45 LFO to have an hypertriangular waveshape that matches the Rds v/s Vgs relation I posted above. Great improvement, now the sweep is much more even and behaves nicely at high speed settings, instead of making me feel seasick. The con is that it needs a Quad OpAmp + 78L05 + 2N5088 + 4 diodes + resistors and caps instead of the single Opamp, but absolutely worth it in my opinion, so I'll make a PCB for it. I'm not following the KISS philosopy for my boxes anymore. I just want the best possible sound. Will let you now when I do the next matching round with the Vp and Idss parameters. I'm not following the KISS philosopy for my boxes anymore. I just want the best possible sound. I believe Einstein said something like: "As simple as possible --but not too simple"
with no consideration of the circuit itself.
" I've had it with cheap cables..."
Eric, you really nailed it with that Einstein's quote. It reflects perfectly my philosophy. I am adopting it for my signature, if you don't mind. THe ohter side of that one is 'if it works don't fix it". It can be more complicated to make something more simplified..
Did some work on an op amp circuit that automatically adjusts Vgs to whatever voltage is required to achieve a specified channel resistance. This idea may be applicable to FET matching. The basic idea is to servo the Vgs to hold the drain voltage constant at a small value, while injecting a small constant current into the drain (the source is grounded). I used about 30 mV on the drain, corresponding to the low peak-peak signal swings used in phaser circuits. The idea is to maintain the FET in the triode (resistive) region. A Howland current pump was used as an adjustable current source. By varying the current, the channel resistance also varies, since the drain voltage is held constant. To match FET's, you could measure the Vgs for each FET in a batch with this circuit, using several current settings, corresponding to the range of channel resistances the phaser circuit requires. The original application was a sweep circuit that provides a V/oct sweep in response to a linear control voltage, but using FET's instead of OTA's. As you can see, there are two good candidates for pairing, marked with * and #. Notice devices 08 and 09 have almost identical Vp (-2.70 & -2.69), however their Idss are quite different (6.30 & 6.68). This validates that matching in terms of Vp or Idss only is not enough. I chose pair 13 & 14, using a representative Idss of 7.66 mA and -3.00 V for Vp. I adjusted my LFO to move within this range with a DVM at very low speed, and wow! Very intense phasing effect! So far this experiment gives me peace of mind on this improved matching method. Initially it appears that the Vp grows monotonically with Idss, however, if you look at device 11 you'll notice its Vp went down. I double checked this reading and the ones around devices 10 and 12 to make sure this wasn't a procedure mistake. Also, on some deices Vp remains nearly identical within two consecutive devices while Idss increases, as is the case for devices 08 & 09. I would be quite interested in seeing the differences in phasing between the devices you selected and the pairs you'd otherwise select by Vp only, for instance 8/9 and 10/12. It would be interesting to see scope traces for the differences in phase notches. I would expect 8/9 to vary only 6% in Rds, 1.06 being the ratio of the two Idss-s. So we need to see some traces.
" Everything should be made as simple as possible - but no simpler"
Hand me an object and I'll mod it ; doesn't matter what it is. It's a hopeless addiction --one that I enjoy. I'm a perfectionist living in a world that isn't interested. Sound familiar?